It’s been two months since my last blog article. That sounds like a confession of a sin and in some ways it is, as I have deliberately stayed away from blogging over the past weeks. I was told by Sophie who set me up for blogging, that I “must” write one, or better two articles, a week. Sorry Sophie but two articles a week is just too tough for me. My reason for the recent lapse is I had to focus, even over Christmas, on my company Relequa. We are at a very exciting and very busy stage of developing and launching a new instrument for looking at the way moisture interacts with materials. During this activity I visited a printing company in Belfast. The owner of the printing company asked what Relequa was about and when I explained he said “air conditioning was invented for the printing industry”. Immediately that comment was lodged in my brain with a label “must investigate if that’s true”.……..
Because air conditioning has been used for a long time and printing’s been around very much longer, I thought getting to the origin of where and when the two came together might be difficult. Not so, thanks to Google and Wikipedia. Before I get into location and date of this event, let’s quickly look at the “why”. In the PowerPoint presentation I use for introducing people to our company Relequa, I start the story in 1871. This date is one of the earliest references I’ve found to a scientific approach explaining movement of moisture in the air. 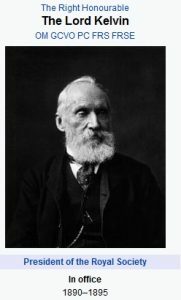 The published paper by William Thomson, who became Lord Kelvin, a famous scientist, mentions about the effects of moisture on materials. Unconnected to moisture, around about this period in history, people were inventing new ways of using ice to cool air as a means of “conditioning” working and storage areas. By the beginning of the 20th century printing technology had become more sophisticated. Printers striving to get high quality print in high volume using new technology were running into problems with printing paper. It had been worked out by then that the methods for making printing paper were important for different types of printing. Science was applied and people gained an understanding that the fibres in the paper, the “grain”, had a role in holding the printing ink. What people did not really understand at this time was how moisture affected the alignment of paper fibres. In one of my blog articles I talk about how moisture interacts with paper fibres pushing them in different directions to distort sheets of paper. Printers operating around the turn of the 19th-20th century, made observations that their printer paper would behave differently when in different rooms and at different times of the year. Wrinkling, particularly at the edges, was a big concern. Links were made between printing quality, location within the print works, humidity and the weather. Time for somebody you have probably never heard of to arrive. 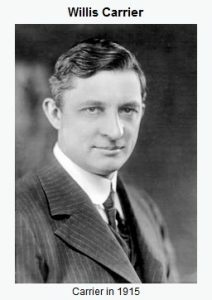 Bringing together the ideas around cooling air to “condition” it and to give the printing industry an answer to their wrinkling paper problem, Willis Carrier, in 1902, invented mechanical air conditioning for the Sackett-Wilhelms Lithographing and Publishing Co. in Brooklyn, New York. And what a major impact Carrier’s invention was on our lives. So, what I was told in Belfast was true about air conditioning being invented for the printing industry. In this blog article I’ve given you a short helicopter view of how I got from a throw away comment on a visit to a print company to the invention of air conditioning. As for myself I drilled down deeper into the literature. I found two science based publications, one from 1927 and the other 1934. Both talk about studies that were done on the effects of humidity on paper used in the lithographic industry. Basically these papers take the earlier observations made by printers on their printing quality issues and come at the problem with a much more scientific approach. The 1934 paper is a detailed report on technology used in printing and how atmospheric conditions effect different types of paper during storage and when being used for printing. 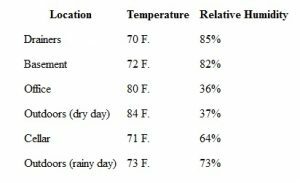 Of course, the researchers performing the studies were greatly assisted by technology that had been invented for better relative humidity (%RH) measurements. Without looking into the detail I cannot say exactly how the %RH measurement instrumentation evolved over the first part of the 20th century. But I imagine that shortly after the invention and spread of air conditioning, ways of better measuring its effectiveness were quickly developed. In the 1927 paper, with the simple and descriptive title “The Effect of Moisture on Paper”, I was delighted to see a description of the physical process by which paper comes to equilibrium with moisture in the air depending on the humidity. The author is Helen Kiely (there must be an Irish connection there) and she was Chief Chemist at the American Writing Paper Company Inc. We now use the term Equilibrium Relative Humidity (ERH) for this “Effect of Moisture” and is the subject of Chapter 3 of my eBook. 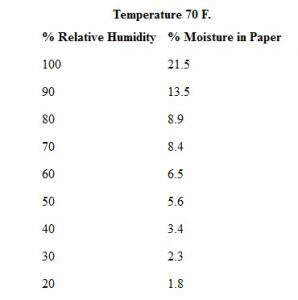 To describe for you this effect another way, ERH is the “driving” force for the paper to adsorb moisture, but this only happens when the humidity reaches a certain level. Helen shows a tabulation of the range of temperatures from different parts of a paper mill. Then follows with a table of the amount moisture present in paper at different relative humidity values. If you would like to read Helen’s paper it’s available online. I’m continuing a search for when moisture equilibrium in materials was first described. My aim is to fill in the timeline between William Thompson’s 1871 paper and the 1927 published research. If you just happen to know of any descriptions of equilibrium moisture or scientific papers around that time, I’d much appreciate hearing about them. Please use the Comment box below.